Aerobic Septic System Installation & Maintenance in Collin County, Texas | "Let Dewey Do It!" 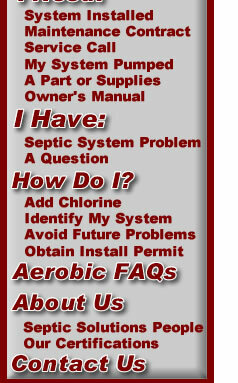 Septic Solutions, McKinney Texas - We are a full service -- all types of septic systems company. We specialize in septic system installation including septic tanks and aerobic septic systems, service, pumping, and repair. We have 20 years experience in the industry and enjoy a well-deserved reputation for customer service and quality work. We offer three maintenance contracts for North Texas owners of aerobic septic systems: Our Bronze service covers required inspections and reports. Our Silver service includes our Bronze service coverage plus chlorine maintenance. Our Gold service includes Bronze and Silver services, plus all repairs, parts, and labor resulting from normal usage. We are located at 3366 East University Drive, McKinney, Texas 75069. Office: 214-733-8883. We also offer free repair estimates for owners of malfunctioning conventional absorption field septic systems with purchase of a pumping. We have a modest $75 (maintenance contracted customers) & $125 (non-contracted customers) charge for examining aerobic systems as many problems can be resolved during this initial examination visit. Non-contracted customers can apply $50 towards a maintenance contract. We proudly serve all of Collin County, Texas as well as the following communities: Fairview, Murphy, Wylie, Culleoka, Farmersville, Gunter, Lucas, Melissa, Anna, Van Alstyne, Prosper, Blue Ridge, Plano, Allen, Royse City, Caddo Mills, and Princeton.